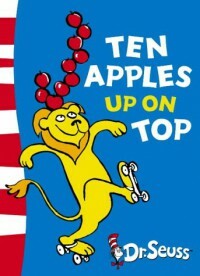 Ten Apples Up on Top is such a cute story written in a similar style to Dr. Suess books. It is about a group of animals competing to see who can stack the most apples on their head. This book is a great way for younger students to practice counting from one to ten. As the animals add more apples to their stacks the other animals in town become upset and try to knock down their apples. The next pages that follow have a lot of exclamatory dialogue and opportunities to read with intonation, so this would be a great practice for that.